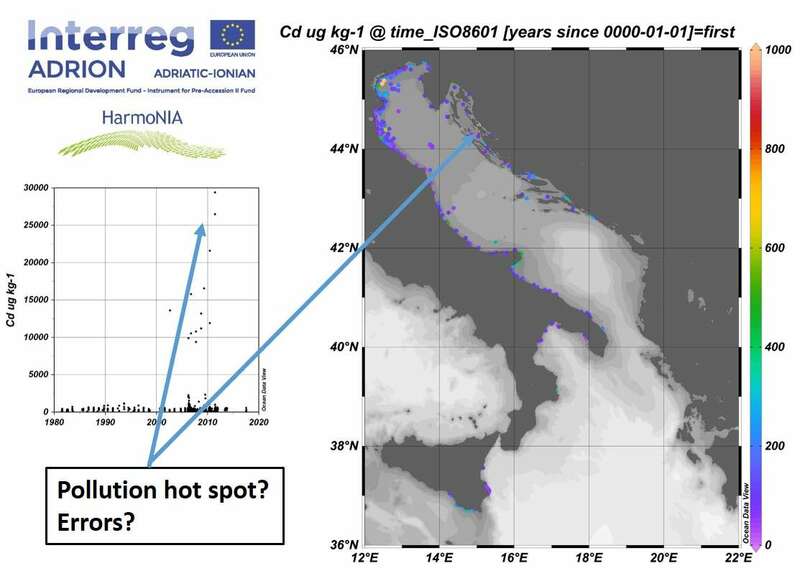 In the framework of the Interreg ADRION project "HarmoNIA - Harmonization and Networking for contaminant assessment in the Ionian and Adriatic Seas", EMODnet Chemistry data have been used to identify the most common problems encountered when merging datasets deriving from different institutions and the main targets of data Quality Control procedures. The objective of HarmoNIA project is twofold: to share best practices to support transnational harmonization for MSFD and UNEP/MAP protocols implementation and to strengthen the network of marine data infrastructures to facilitate access and re-use of marine data among countries bordering the Adriatic – Ionian Seas. In order to promote a harmonized approach to the evaluation of quality of data of contaminants in the ADRION region, a subset of EMODnet Chemistry data were analyzed to identify measurement units used by the different laboratories, matrix characteristics, concentration ranges as well as completeness of required metadata. According to the results, a common protocol and statistical approach to assess Quality Control of data of contaminants in the marine environment will be proposed and shared within HarmoNIA as well as within EMODnet Chemistry partnerships to improve data quality and fitness for use.